Willkommen to RedDot Brewhouse Oktoberfest 2014! 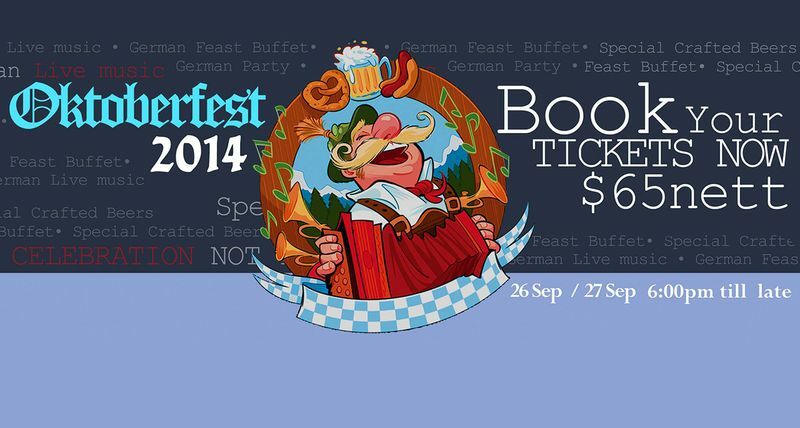 This year, RedDot Brewhouse Dempsey will be hosting a German Buffet Oktoberfest Party. The Bavarian festival which started in Munich, Germany in 1810 is now celebrated in over 50 countries worldwide. So grab your friends, colleagues, and family for a memorable evening of the most authentic German Buffet, German beers, German Live music, German costumes! Taste the finest German gourmet food with favorites such as crispy pork knuckle, fresh pretzels and German sausage. Wash down the German feast with RedDot brewed beers. The German Buffet party will be held on Friday 26th September and Saturday 27th September at RedDot BrewHouse Dempsey starting from 6pm till 11pm. Oktoberfest is a celebration not to be missed! Celebrate the great beer festival @ RedDot BrewHouse Dempsey only! Contact our Corporate Sale Department at 6535 4100 or rd@reddotbrewhouse.com.sg for group bookings and more information.